Did you know that you can start your own personal fundraiser on Facebook? 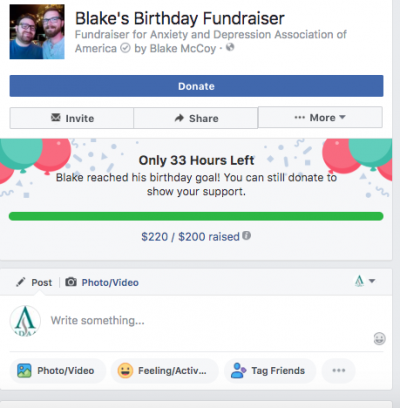 Support ADAA and our mission by creating a fundraiser on Facebook for your birthday, one of our mental health awareness initiatives, or for any reason at all! You can raise funds and awareness for ADAA without leaving Facebook, and ADAA will receive the proceeds of your fundraiser within a few weeks. Your support allows ADAA to continue to provide free resources to those battling anxiety, depression, and co-occurring disorders. We are very grateful for the many ways that donors choose to support us and are also thankful for those in our ADAA community who take initiative to raise awareness about mental health issues to help us #breakthestigma. 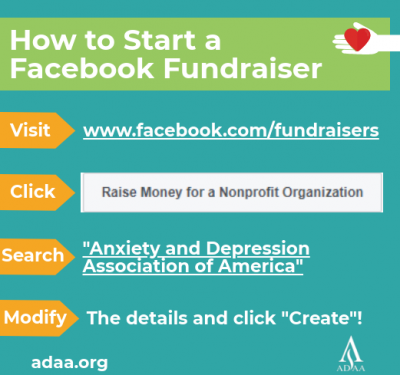 Learn how to start a Facebook Fundraiser for ADAA below! Start your own Facebook fundraiser here today!